His nickname was “Nifty”, and if you ever saw Rick Middleton play you would understand why. Few snipers could skate in on a goaltender or dangle the puck the way that he could. In fact, the term “dangling” in hockey might best belong to Middleton. It was the way he did it. When lovers of the game think of “danglers” or players that seem to have the puck on a string, they usually think of Pavel Datsyuk, Denis Savard, maybe even Alex Ovechkin. Middleton was different. It wasn’t as if he had the puck tied to his blade. Rather, the puck was loose and free for the taking, but you just couldn’t catch the guy. There were times that Middleton literally leaped through the air to get by defenders. He was like a “Wild Mouse” carnival ride or a lightning bug as he zipped across the ice. Somehow though, as time has gone by “Nifty’s” accomplishments have been forgotten. A victim of time, Middleton is virtually unknown by fans under 30. Make no mistake, if you don’t know who Rick Middleton is, it is a huge loss for you. The late, great comedian Rodney Dangerfield coined the catchphrase, “I don’t get no respect!”. Those words ring true for Middleton. While playing for the Oshawa Generals in junior, Middleton led the Ontario Hockey Association in scoring during his final year. With an incredible 67 goals in 62 games during the 1972-73 season, he also tacked on 70 assists to have 137 points on the year. You would think that leading the league in points would make you a shoo-in for a First Team All-Star selection. Instead, Middleton was a Second Team choice. Not surprisingly, however, he was drafted 14th overall in the 1973 NHL draft by the New York Rangers. What is surprising is that he went 14th considering some of the players selected ahead of him. Tom Lysiak went 2nd to the Atlanta Flames – he played 86 games less than Middleton but scored 156 fewer goals. Goaltender Terry Richardson went 11th to Detroit – he only played 20 games across five NHL seasons. Morris Titanic went 12th to the Buffalo Sabres – as many say, he “sunk like the Titanic too” as his NHL career lasted a mere 19 games. Only three players selected ahead of Middleton made it to the Hockey Hall of Fame: 1st overall selection Denis Potvin, 4th pick Lanny McDonald, and the 8th selection Bob Gainey. Middleton played longer and had better numbers than the remaining 10 players selected ahead of him. Middleton’s rookie year in the Big Apple was limited due to injuries but he was nearly a point-per-game performer. In 47 games with the Rangers in 1974-75, he tallied 22 goals and 18 assists for 40 points. In his sophomore season with a full 77 games, his point totals were 24-26-50. Then a sizable trade happened, which in turn seemed to set Middleton’s scoring prowess on fire. The Rangers sent Middleton to Boston for longtime “Big, Bad Bruin” Ken Hodge. Boston most assuredly won the deal. Middleton was only 23 years old at the time and would play 12 more years with the Bruins. Hodge, who was 31 at the time of trade and turned 32 a month later, suited up for only a season and a half with the “Blueshirts” before finishing his career in the minors. Once in Boston, Middleton came under the tutelage of hockey icon Don Cherry who coached the Bruins at the time. With Cherry at the helm, Middleton flourished for many seasons in Boston. From 1976 until 1988 Middleton was the premier winger in Boston. In four of his 12 seasons in “Beantown”, he led the Bruins in scoring. The 1981-82 season was the only year that Middleton would eclipse the 50-goal mark, but he had five straight seasons of at least 40. Only twice during injury plagued seasons did he ever fall below 20. Middleton also had two 100-plus point seasons in 1980-81 and 1983-84. When his career ended after the 1987-88 season, Middleton totaled 448 goals, 540 assists and 988 points in 1,005 games. He would have had more had it not been for an odd injury. During the 1986 season, Middleton was hit in the temple with a puck during practice. Though he continued two more years after that, he did so while dealing with reoccurring headaches. Were it not for that freak injury, there is no doubt that Middleton would have hit the plateaus of 500 goals and 1,000 points. More importantly, he would not have been overlooked for so long as a Hockey Hall of Fame inductee. Even so, Middleton’s 448 goals are well more than numerous players who have already been inducted into the Hall. His final goal total beats out Pavel Bure, Yvan Cournoyer, Dave Keon, Paul Kariya, Steve Shutt, Bill Barber, and Rod Gilbert, to name a few. Granted, Middleton played in more games than some of those players, but not all of them. Gilbert, Keon, Ted Lindsay, Bobby Clarke, Henri Richard, Andy Bathgate, and Adam Oates all played in more games (some of them many more games) than “Nifty” did and scored less goals. Yet, all of them have still been inducted into the Hockey Hall of Fame. What is far more telling, is Middleton’s percentage of goals scored per games played. Presently, Middleton ranks 59th best of all time with 0.446 goals scored per game. Now, some naysayers are thinking, “59th – big deal”. But we are measuring these players on their ability to produce. In the amount of games that they played, how often did they score for their hockey clubs. Middleton’s goals per game is better than Bernie Geoffrion, Glenn Anderson, Dale Hawerchuk, Darryl Sittler, Cournoyer, Brendan Shanahan, Gilbert Perreault, Mats Sundin… and the list goes on and on. Those are huge names, and all of them have been inducted. Statistically, Middleton has proven that he was a better goal scorer than all of them. In his 14-year NHL career only twice did Middleton not play in the postseason, those being his 1975-76 season with the Rangers and the year of his injury, 1985-86 with the Bruins. Middleton’s Bruins actually made the playoffs during the 1985-86 season but were swept in three games by the eventual Cup-winning Montreal Canadiens. One would have to surmise that they missed the talents of their star winger during that go-round. Regardless, to play in the postseason in 12 separate seasons is a remarkable achievement. By far Middleton’s finest playoff performance came during the 1982-83 season when he wrote history. While the 1982-83 Bruins lost in the semis to the New York Islanders, “Nifty” still scored a remarkable 11 goals and 22 assists for 33 points in only 17 playoff games. Here is where he had astounding numbers: in the seven games that he played in the second round of the playoffs against the Buffalo Sabres, Middleton scored 19 points (five goals, 14 assists). No one – not even Wayne Gretzky – has ever equaled that mark, making Middleton’s 19 points in one playoff series an NHL record that still stands today. Considering the present level of scoring in today’s NHL, it is also likely that mark will stand forever. Separately, Middleton’s 14 assists versus Buffalo is also an NHL record that he shares with Gretzky. While Middleton achieved it first, “The Great One” equaled the mark two years later. Middleton never won a Stanley Cup, and ultimately that works against him. However, he came closer than most. He made it to the Stanley Finals with the Bruins on three separate occasions in 1977, 1978 and 1988. In 15 games in the finals, Middleton scored one goal and three assists. Certainly he would have wanted to score more, and in turn may have been able to lift the Cup. There are, however, two very key points to be made about his three trips to the championship round that do work in his favor. The first being the opportunity. Middleton had the opportunity to vie for the Stanley Cup three times. Hockey Hall of Famers Marcel Dionne, Bernie Federko, Harry Howell, Sittler, Borje Salming, Mats Sundin, Peter Stastny, and Mike Gartner never even had one opportunity to play for the Cup. Yet, all of them have been inducted. The second key point is longevity. Middleton played for the Stanley Cup in 1977 and 1978 and then did it again 10 years later. 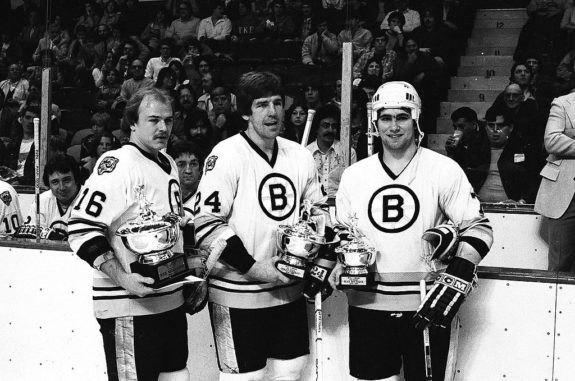 The Bruins of 1977 and 1978 were comprised of other Hall of Famers like Jean Ratelle, Brad Park, Gerry Cheevers and Johnny Bucyk. Ten years later Middleton linked his veteran leadership and playing experience to the following generation of Bruins and NHL legends Cam Neely and Ray Bourque. To have the talent and the relevance to play for a championship with a decade in between speaks volumes to Middleton’s importance. There are a few other accomplishments of Middleton’s that are worth mentioning. During the 1981-82 season, when he set his career high in goals, he was awarded the Lady Byng Trophy for his sportsmanship and excellent play. Similar to inductee Gilbert Perreault, this was the only major award of Middleton’s NHL career. He would also be selected for the NHL All-Star Game on three times in 1981, 1982 and 1984. Hailing from Toronto, Ontario, Middleton represented his country at the 1981 and 1984 Canada Cup tournaments. The numbers and the achievements are all sufficient for Middleton to receive Hall of Fame induction. Arguably the biggest feather in his cap was the rate that he was able to produce goals. While most of his 448 goals were unforgettable in nature, his name has been overlooked as of late. Perhaps in reading this a new found appreciation of Rick Middleton is achieved. If the right set of eyes are seeing it and reconsidering, he may finally receive the induction that he deserves.